Here we go with another Lab with GNS3 and IOU. This time is to review and practice the OSPF configurations as well as LSA types, Areas, routing table, virtual links and whatever you’d like to study for OSPF. The exercise rebuilds the one reported in TCP/IP Volume I book on Chapter 8. As always the initial setup is already arranged for you and you can find the GNS3 files here. 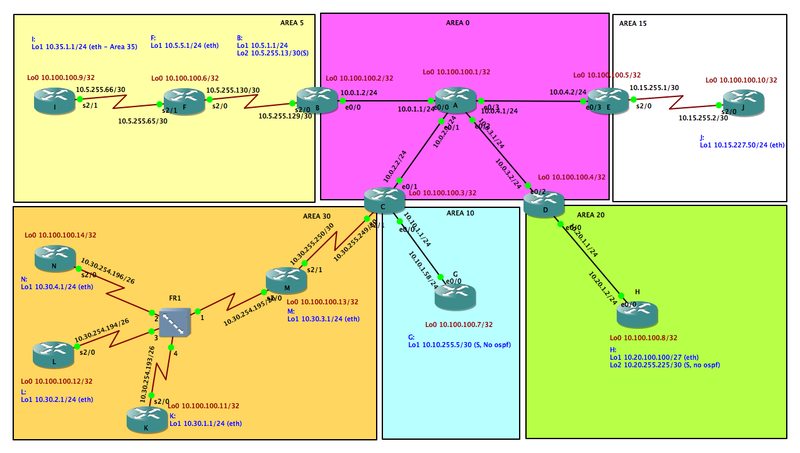 5) Network on Interface lo2 of router H is not part of OSPF. Consider as it is coming from another routing protocol and have it advertised in the OSPF domain not allowing any Type 5 LSA to enter the Area 20. UPDATE: You can find the final configuration file here. Can I get the solution configs? that would be awesome. of course. I will prepare files during the weekend. please find the final configuration file in the link I added.